Having never been to Florence, visiting the Uffizi Gallery was at the top of my list for its amazing art collection. But like everything in Florence, I found much much more. I would have bought a ticket to walk through the building alone–even without its hundreds of marble statues! Every doorknob and every beam is so intricately crafted; a work of art can be found in each. Forgive my somewhat shaky hands as I took photos of these masterpieces. While I’ve really honed my art education on the French impressionists and their contemporaries, I was wowed by the Italian collection. These works of art have become so ingrained in our pop culture–especially the Birth of Venus–that I wasn’t prepared for how incredible it would be to see them in person. I wasn’t allowed to take photographs in my favorite part of the Uffizi–a new, interactive piece detailing the night when the gallery was victim to a Mafia hit. In 1993, a car bomb exploded just outside one of the gallery rooms, killing five visitors and destroying three priceless works of art. The charred remnants of one painting, Gerard van Honhorst’s “Adoration of the Shepherds,” has been repurposed to tell the story of that night in a very chilling, dramatic way. A must-see. 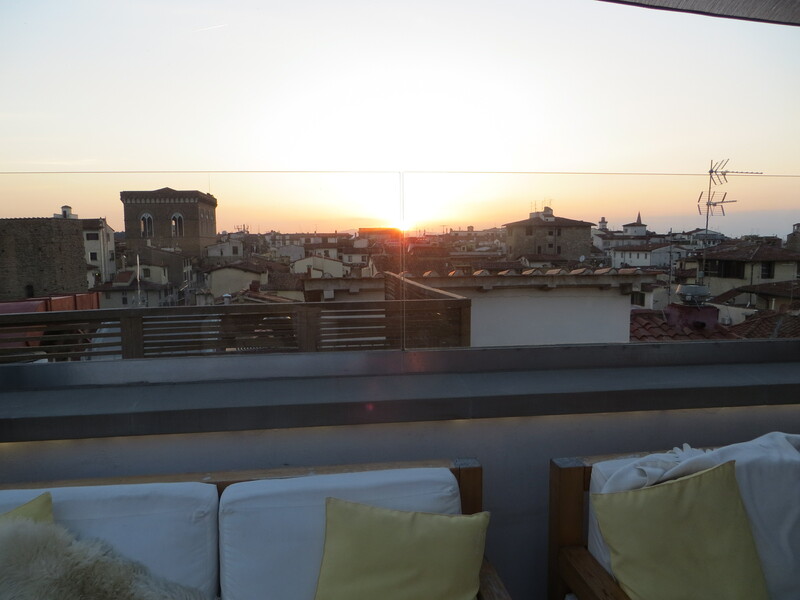 Boasting the “best views of Florence” we tried the Grand Hotel Cavour’s rooftop for sunset aperitivo–and we were not disappointed. Situated right next to the Duomo, the views from this tiny bar are almost overwhelming. We let the samba music and prosecco wash over us while we wordlessly smiled at each other, giggling over our good fortune. Aperitivo is a magical pre-dinner hour (hours?) that all of Florence celebrates with cocktails and little nibbles. You will find bars offering “free aperitivo buffets,” but I’d recommend seeking out only the best since it is so ubiquitous throughout the city. This is a great article detailing why aperitivo is part of the Florentine culture and the best spots to celebrate it. And finally, details on my favorite dinner in Florence–Trattoria Sostanza. This old school restaurant is for visitors who want to experience classic Florentine cuisine. You won’t find an experimental amuse-bouche or an inventive cocktail list here. You get the feeling that Florentine babies grew up eating like this and that all the recipes were someone’s grandmother’s at some point. For a Bakersfield girl, it reminded me of my favorite Basque restaurants around my hometown–no-fuss cuisine, sitting elbow-to-elbow with other diners. Although I was tempted to order the classic Florentine bisteca (steak), I’d been told that the pollo al burro (chicken in butter) is out of this world, so I ordered it. And it was. I lapped up every butter-soaked bite. I may never have chicken that good again. Grand Hotel Cavour. Via del Proconsolo, 3, 50122. 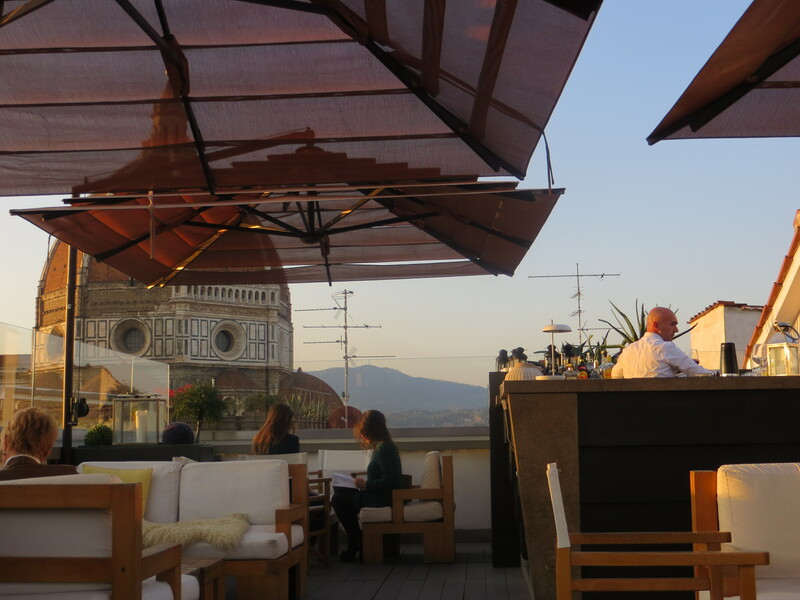 Running from 4:30pm until 11pm, aperitivo simply doesn’t get better than from this rooftop. A glass of wine or prosecco runs about 10 euros, but it comes with delectable little Italian snacks and a close-up view of the Duomo. I’ve heard reservations are recommended, but we had no trouble. Trattoria Sostanza. Via del Porcellana, 25/R, 50123. This old school Florentine restaurant has a legendary reputation–all word of mouth. You must have a reservation at one of their seatings–7:30pm or 9:45pm–on one of the few evenings they are open. Mercato Centrale. Piazza del Mercato Centrale, 50123. Consider the first floor a museum of Italian food (you’ll get an education walking around) and the second floor your go-to lunch or dinner spot. After failing to make a dinner reservation while marinating on Hotel Cavour’s roof, we had dinner in the Mercato. Also inside the Mercato: Lorenzo de Medici’s cooking classes. La Divina Enoteca. Panicale 19/r, 50123. If we had more time in Florence, we would have ventured out to the Tuscan vineyards, but this was a great alternative. Held every evening (but Monday) at 5pm, this 1.5-hour course covers olive oil, one white wine, three red wines, and cheese. Located just outside Mercato Centrale at a shop facing the Market. Uffizi Gallery. Piazzale degli Uffizi, 6, 50122. If you are traveling to Florence you likely already have plans to visit, but do not get on the airplane until you have reserved and printed out tickets. Otherwise you may spend half a day in line. Also recommended: a docent-led tour. Paige, don’t you yearn to return to Florence already! I only spent a day there but how memorable it was. I still swear the David was breathing. My mouth still waters at the memory of the linguine alle vongole. I also enjoy walking and exploring the area where I’m staying but will take your lead and expand my exploration and do it immediately upon arrival. As always, I so enjoyed your blog. It’s what I love waking up to. Ciao Bella!! Grazi! We had such a wonderful time at Sostanza and Bryce was reliving all the wonderful memories from when y’all were there. Thank you! I really relied on your blog to make Florence plans–can’t thank you enough for all of your recommendations! That warms my heart to hear :), come back soon ok?